Leaving Banff was hard. You can spend a month there and touch very little of all the amazing trails, bodies of water, mountains and sights that the area has to offer. With that said, we were excited to get Tin E back in the shop in Spokane, fix the water tank and finally enjoy the trailer the way it was meant to be enjoyed. The guys at Airstream of Spokane have been outstanding to work with and they did it – we now have a fully functioning water tank! Most importantly, you my dear reader don’t need to hear about our water issues any longer. Oh, except that we might have a leak coming through one of our fans in the roof!? From Spokane, we travelled West to make our way towards Seattle. First stop was Spring Canyon Campground on Lake Roosevelt. The lake is right next to the massive Grand Coolee Dam which supposedly is a pretty big deal for all the Dam aficionados out there. Arriving at the campground without a reservation, we didn’t think we’d have a tough time as the lake was in the middle of nowhere. We were wrong. The campground was filled to the gills and luckily, we got the last RV space. The day was a scorcher for Washington standards (about 90 degrees) and rather than sit around in our boiling aluminum can, we decided to high tail it to the “beach.” Walking towards the beach, we kept hearing Eastern European accents. Spending a lot of time in Canada, Idaho and Washington State, we haven’t heard many accents outside of a couple “Ehhh’s.” As we made it to the beach with about 150 other people, we realized EVERYONE is speaking Russian (or some former USSR dialect). Not just the adults, but little kids too. Did we somehow teleport to the Baltic Sea? Curious, we asked the one person who could help us, a five-year-old who was playing with E. Arianna told us they were there for a party and that everyone lived in Spokane. Doing my due diligence, I met Vadim later (not five, but probably forty-five) who confirmed my initial thoughts – Arianna told us lies to get us to leave her alone. Vadim said that they were all from Seattle and that they came every year to get some sun. Wikipedia later informed us that Seattle and Spokane have a very large Eastern European community. So maybe Arianna wasn’t lying after all? We had a great time with the Russians and enjoyed their folk music later in the evening. E made a bunch of friends and kept up with her creeper campground introductions. This consists of her walking up to another campsite (with kids) and saying, “hi, hi, hi, hi,” until she feels comfortable enough to sit down next to the kids and start playing (whether they say hi back makes no difference). There’s a photo below of her chilling out in a raft known as Red October. Later in the car, E told us what was in her opinion a “hilarious story.” She said, “Mommy, Daddy, those kids I met they said to me – you need to go back to your campsite. But, I said, “nooooo, I don’t need to, my Daddy said I could play outside! Hahaha, they didn’t know that my Daddy said I could play.” 3-year-old ignorance certainly is bliss. 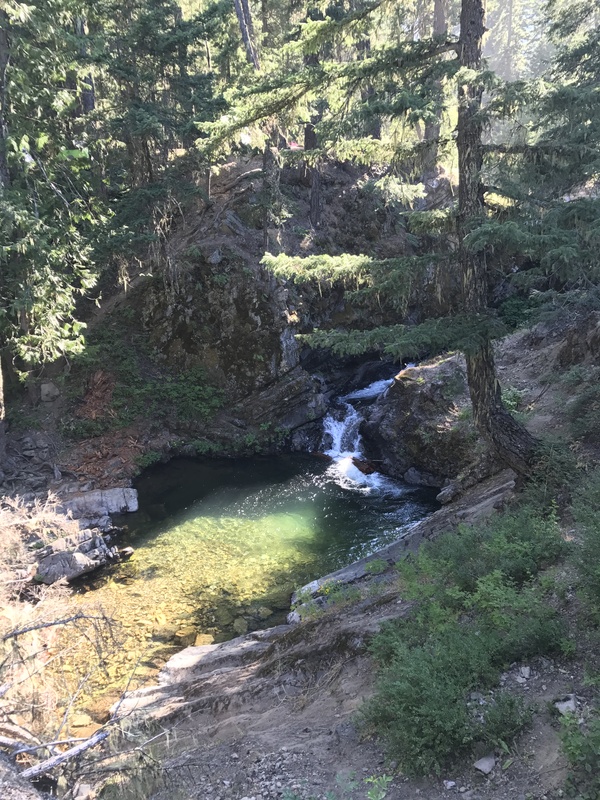 Leaving Lake Roosevelt, we headed for the Cle Elum River in the Wenatchee National Forest, where according to a blogger I found, we would find some incredible boondocking campsites (feature photo above is from the area). The drive into the campground was an adventure, to say the least. Read “The Silver Bullet Returns” and this was like that except on land. Big potholes, tight turns, creeks to drive though, bridges to cross and several trees that almost took out Tin E, the drive had it all. By the time we made it to the campground, I was already cussing out this blogger in my mind (note to self and everyone out there – don’t trust bloggers). It was only then that the real fun began. You know that feeling when you go to a party, you don’t know anyone there and everyone is looking at you? It was kinda like that. Whereas, the previous campground was family oriented and everyone was welcoming, the vibe at this campsite wasn’t exactly warm. The other kicker, we’re deep in the woods, off the beaten path, and this is not a regulated campground of any sort. The area was filled with several VERY large gatherings of dudes who were there to party, hard. Running the numbers in my head, I was guessing that at around 11pm that night there would have been 4,000 beers drunk and Tin E is sitting in the middle of the party. If something were to go sideways, my crew consists of a 4’11 ninja, two rugrats, and one can of bear spray. To make matters worse, as we are returning to Tin E from a walk down to the river, I see a couple of kids pointing a .22 rifle towards us. Wtf!? Turns out they were aiming at some cans, but that didn’t do anything to calm the nerves. Check please! Just like Bo and Luke Duke, we slid across the hood of our truck and got Tin E out of there. The campground about a half mile away wasn’t scenic, but it ensured us an uneventful night. Bloggers can go to hell. Yikes!!! Funny story but you makin me anxious. Spoiler alert…glad I know you safely made it to Seattle.